The Christmas selling season has begun ! The starting gun has fired! The television commercials have begun...the stores are decorated...I even saw Santa yesterday in my local Mall.... it's time to begin your Christmas auctions! Just turn on your television and you'll see a barrage of holiday commercials. The eBay home page even has a calendar counting down the days until until Christmas. So the message is drummed into the consumer's heads - it's Christmas shopping time! As a seller you have to get busy right now. I like to start selling Christmas gift items the week leading into Thanksgiving. If you begin a seven day auction right now, it will run past Thanksgiving, through Black Friday and into Cyber Monday. I am not rushing the season. For all intents and purposes your selling period basically ends around December 20th. You need those remaining days to mail your sold items out to buyers. Having your sold stuff shipped in a timely manner is critical: hell hath no fury like an eBay buyer who doesn't receive their purchases prior to Christmas. To make selling all your stuff more manageable, you may want to shorten your auctions to only five days. If you have lots of inventory, a shorter auction will free up more time to wrap and ship. As the dreaded December 20th deadline approaches, I shorten my auctions to five and even three days auctions. I don't want to cut it too close to Christmas. Christmas is also the time to get rid of your "dead wood" inventory that you couldn't sell during the year. Because there are more buyers looking, these items will usually find a bidder during Christmas. Above is a pair of Hallmark Christmas train ornaments. Yeah, I know it's a Christmas item, but I listed these several times just prior to the Holiday season believing a train collector would snap them up. They are replica's of Lionel train engines, very realistic and pretty cool looking. Unfortunately these things languished for several auctions during the Fall months. Finally I re-listed them during the holidays, and instead of seeing big fat goose eggs like previous auctions, they were bid up fast and furious. The set closed at a selling price of $26 dollars! HO-HO-HO! So get digging through your inventory and post with reckless abandon! The time to sell is now...miss out on the Holiday selling window and your stuff may end up on a table at your next Garage Sale! Pssst, wanna make some money? Two words: Pottery Barn. Did you ever notice that there are some name brand products that carry a certain cachet about them? These companies have an enthusiastic and loyal following due to the style and quality of their products. Some examples that come to mind are; American Girl Doll, LL Bean, and Lenox. They all have a strong name brand loyalty and buyers flock to them. I guess you could say they're the "gold-standard" in their field. A definite "gold standard" company that you can add to this list is Pottery Barn. This retail and web-based company markets home decor stuff that seems to be all the rage in home decorating. Their prices range from moderate to high, but that fact doesn't seem to scare off buyers. Take a look for yourself, just type in "Pottery Barn" in your eBay browser and see what comes up. You'll find tens of thousands of items from bedding to candles to telephones...many with nice high bids! Within the galaxy of PB stuff sold, I've found a "sure thing" item to turn a nice little profit on are the Pottery Barn telephones. Over the years, PB has sold a variety of styles based on the traditional rotary desk-top and wall telephones. In the Pottery Barn stores these phones list for as much as $80, but at the garage sales they can be had for five bucks or less. All are designed with that old "retro" look but with updated push buttons in place of the old rotary dial. Colors include silver, red, gold, white and more. But for my money the most popular of all is the traditional black models. The basic black telephones can pretty much fit in any decor and look way-cool. The pictures above are some Pottery Barn phones I've scored this garage sale season. The desk top version seen on the right was found on my very first garage sale stop back in July. I paid all of three bucks for it. The phone had a couple scuffs which I pointed out in my auction description but bidders didn't seem to care. It sold for $44 big ones! The wall unit seen on the left was purchased "NIB" (That's "new in the box" for those of you who don't speak eBay.) I paid five bucks for it and sold it for $56 dollars, that's eleven times what I paid for it! Can you get that return in the stock market? I think not ! So mark down Pottery Barn to your "buy" list when at the garage sales. It's another cache name that really brings in the bidders. If you have a "cachet" name that we all can do well with don't keep it to yourself....pass it along so we all can have fun! Hey lady...Stop what you're doing and step away from the Star Wars set! I had a frustrating experience at a local Goodwill store this past week. One of those disappointing moments that all good garage sale/thrift store hunters endure at some point. Tell me if this has ever happened to you. Normally when entering a Goodwill Store, I head straight to the Men's shirts to begin my rummaging. I am pretty fast, but when you factor in some quick eBay look-ups, it still can takes some time to do. Once through the shirts, I head towards the miscellaneous stuff which is usually in the back of the store. This includes toys, electronics and all the knick-knacks. So on this particular day I went right to the men's shirts as I always do, spending about twenty minutes buzzing through the racks. As luck would have it, I found a duplicate of a baseball jersey I had recently sold for $20.00 on eBay. Not huge money, but now I had one more in the same size which I could easily re-list with no work on my part, a nice find. So I was feeling pretty good about this Goodwill visit but that was quickly about to change. I then made my way over to the toy section in the back of the store. As I walked up the aisle, I watched another customer lean into the shopping carts used to haul out newly arrived merchandise. A smart technique for any thrift store scavenger, these carts are filled with fresh inventory so you want to be the first to look it over. This diligent shopper was digging deep into the cart for something! She looked like Lucy bobbing for apples in that Peanuts Halloween special. But instead of an apple, she pulled out a prized Lego "Star Wars" set from the bottom of the cart! As you may know from my earlier blogs, these sets can bring in huge eBay money. Thinking hope was not completely lost, I hovered near the women as she examined the box. All the while I am thinking to myself, "Put it back lady! Puh-leeze put it back!" My silent wish had no effect because she tucked the Star Wars Lego kit under her arm and walked away. Rats and double rats....she was buying it! As she headed to the cash register, I just so happened to follow with my jersey. (Does that make me a stalker? Hey, I was planning to leave anyway!) I was about two people behind her in the check-out line, close enough to read the Lego set number on the box lid. Because I have a perverse need to torture myself, I immediately looked up the set on eBay as I stood in line. I clicked on "completed listings" and up comes closing prices ranging from $40 to as high as $130! This lucky women paid only $5.99 for the set. As she left, I wondered if she was aware of it's true value or was it just an impulse purchase for her kid? Once outside the store, I watched the lady drive away with "my" Lego set. I briefly thought about throwing myself onto her car window and begging her to sell it to me. I decided against this tactic. I realized any money I made from the Lego set would be off set by my medical expenses after falling from the speeding vehicle! But there is a happy ending to the story which proves everything works out in the end. The following day I was in another thrift store and happened across two vintage Mattel "Speak n Say" toys. 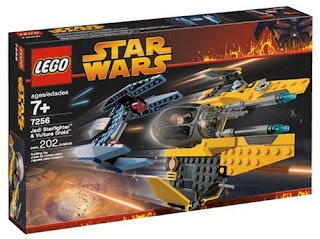 I paid a buck for each and while they may not be as hot as Lego Star Wars sets, I will probably sell each for around $30. When I snatched them up I looked around to see if there were any stalkers (like me) watching. So it's all garage sale/thrift store karma, right? It all evens out in the end. Do you have a "just missed it" moment? Misery loves company, so feel free to share your story with all us.